Revitalize your eyes with this serum from Good Molecules. Wake Up Eye Serum brightens, firms, and reduces puffiness around your eyes with caffeine and pumpkin extract for a noticeably more energized appearance. Massage a drop or two into the skin around your eyes in the morning and at night. Suitable for daily use. I've gone through a lot of eye serums and definitely notice the difference when I skip it in my routine, in terms of lack of moisture. 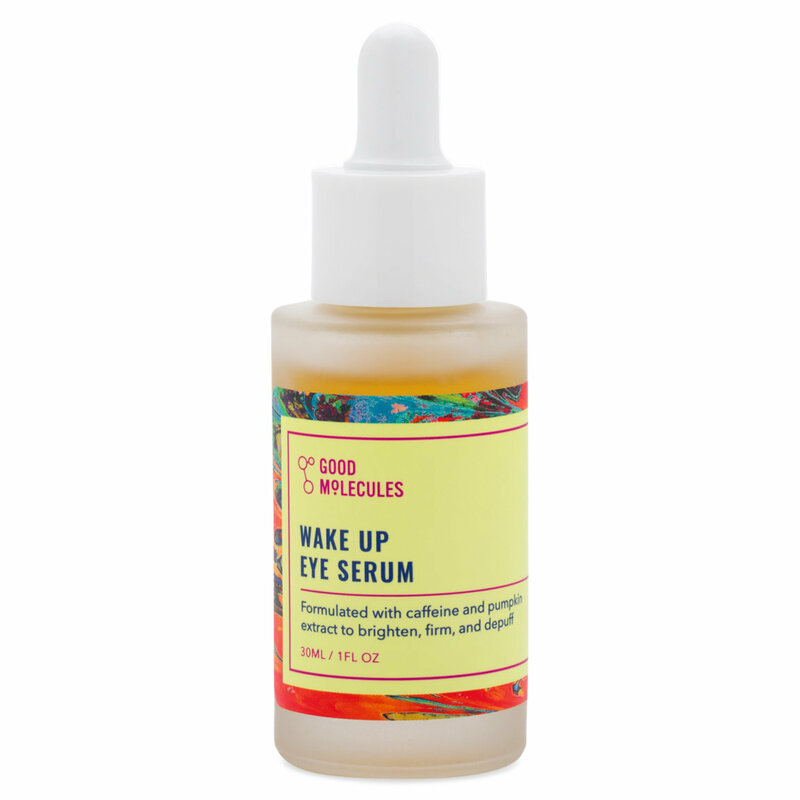 The Good Molecules Wake Up Eye Serum is a nice addition to my routine in the morning. I usually have some fluid retention under my eyes and this serum really does the trick at temporarily tightening the puffiness. The texture dries down fairly quickly but doesn't make my eyelids stick to each other like the Ordinary caffeine solution did. It's also less runnier, so I feel like I can use less product to get the same effect. Another thing that I really love is the packaging. Instead of getting serum on the outside of the dropper where it can drip and you lose product, the Good Molecules bottle has a stopper (like a tube of lip gloss) that prevents too much product from getting on the sides of the dropper. No wasted product and happy undereyes. I invite you all to check the ingredient list before buying this. Don't trust my word, just do your own research. It's mainly water and glicerine with preservatives, and just a few actives at the end of the list, together with EDTA, which is incredibly polluting. I tried using it for a few days on my wrist and, as I have sensitive skin, it sadly gave me a rash. I would never put it close to my eyes. There are much better products at this price point in my opinion. The packaging is really nice, though. I received this product in my Lucky Bag this year. I’ve been using it daily and love how it depuffs and “wakes up” the skin around my eyes. I just saw the email from Nils at Beautylish about the launch of Good Molecules and was shocked at the price! The packaging and quality of the serum feels very high end. I was convinced this was a $95 serum, not $8. I’ll be buying this one again and am very eager to try some is the other products from the line. Because of the stress i've been having in the past few years i look very tired under my eyes. When i was younger just getting more sleep and drink a lot of water would fix this issue but those times seem to be gone. In the past half year i've tried out 3 diffrent eye treatments to fix my problem, all these products had great reviews of people saying that it has helped them. But they didnt seem to work for me. Ive got this serum in my lucky bag and I was happy to be able to try out another brand to help with my problem. Its been 2 weeks of using this product every morning and evening and i actually feel like there is a diffrence. I have the feeling it's less dark under my eyes and i have to use a lot less concealer to appear more awake/healthy! Lets just say i'm very pleased and i would pruchase this product if i ever run out. And i'm serious this product lasts you a long time, after 2 weeks of using it twice a day it still looks new. Love the bottle and the dropper as well. I received this product as part of my 2019 Lucky Bag (like everyone else). I don't usually post reviews of any kind but I felt compelled to after using this product. Previously I had used The Ordinary Caffiene Solution but found I didn't have noticable results so I was excited to try this. I used it for about 4 days before I had to stop entirely. The skin around my eyes became very dry, red, irritated, and a bit flakey. Even with makeup and smoothing primers its still obvious that the skin around my eyes isn't doing so great. Over the past few weeks I've been trying to reduce the irritation and moisturize the area however it's still taking a long time to heal; I don't consider myself to have espescially dry or sensitive skin either. I have attached a photo I took right as I am writing this review as reference. Unfortunately I cannot reccomend this product. I hope this review is able to help others though. I got this in my lucky bag. I used it two mornings in a row and when I took off my makeup I had a rash around my eyes and they were slightly swollen. I don’t consider myself to have sensitive skin so I was surprised when I had an allergic reaction. Beware if you have sensitive skin. I received this in my lucky bag (which wasn't too long ago) and I'm already seeing the benefits! Looking forward to checking out their other projects, especially for the affordable prices! This is not the most flattering (for me) story I could tell on the internet, but it really demonstrates the effectiveness of this serum so here goes. I had a stye recently and I woke up one morning with my eye so puffy I looked like Quasimodo. 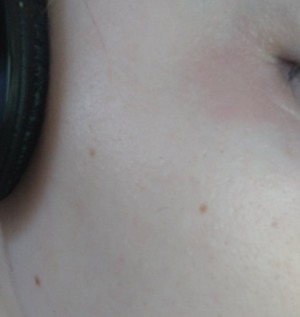 The way I had been sleeping combined with the swelling from the stye made it look like there was a marble under my skin right below my eye, and my lid was puffing out a lot as well. I thought, well Wake Up Eye Serum, show me what you got, and WOW! The size had reduced by half in about 5 minutes, and by the time I got to work that day you could barely tell that anything was weird about my eye. Thank goodness for this serum! Not only did it deflate my extreme puffiness that day (and general puffiness every day) but it feels so good going on! I used to use the Caffeine Solution from The Ordinary and I really didn't like how runny it is, I felt like I had to rush to get it from my hand to my eye before it all dripped down and away. This texture is thick but not too thick, and absorbs pretty quickly without feeling sticky. I also can't say enough good things about the packaging, these bottles also have a really nice stopper that keeps the dropper from being messy on the outside when you pull it out, and also prevent me from banging it against the sides of the bottle too. It does have a little leeway though so you're not gonna be prevented from sucking up all the serum once it starts getting low. I also really appreciate that the labels are all different colors, so I'm not getting all the products mixed up when grabbing at a glance in my cabinet. Such a good product, such good design! When waiting on my Lucky Bag I was actually really hoping for the Peptide Serum because I'm more about preventing aging now and I don't have a problem with eye puffiness. Alas, I got what I got. 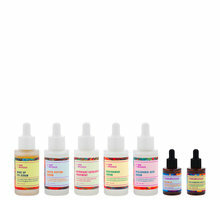 I have very sensitive, combination skin so as always I researched the ingredients before doing a try out. Several ingredients were irritants so I did a patch test (I HIGHLY RECOMMEND anyone to do that before trying new products whether you are sensitive or not) to make sure I wouldn't have to walk around looking like I have red bulbs for eyes. Luckily no irritation happened so I tried it out for a week every morning patting around my eyes. It DOES work for depuffing the eyes when you wake up...but honestly so do a lot of simple at home remedies. I didn't see any brightening or tightening around the eyes but I was honestly just so happy that it didn't cause me to break out or create milia under my eyes. Packaging gets a A+ but I think they may wanna revamp that formula and prioritize the "good" ingredients. I woke up with allergy eyes and put this on and it actually takes the puffiness down within minutes. This is easy to use and a pretty large size for an eye treatment. Most eye creams are .50 oz, so this is $4 when compared to the equivalent size.